BoldBrush — Image color is inverted or shows a partial color overlay. How do I correct this? Image color is inverted or shows a partial color overlay. How do I correct this? Images uploaded to the web are ultimately displayed on a computer monitor or mobile device screen. Images for web display must be .jpg (jpeg) files, in RGB mode (specifically sRGB mode for those of you who edit in Photoshop or similar photo editing software). 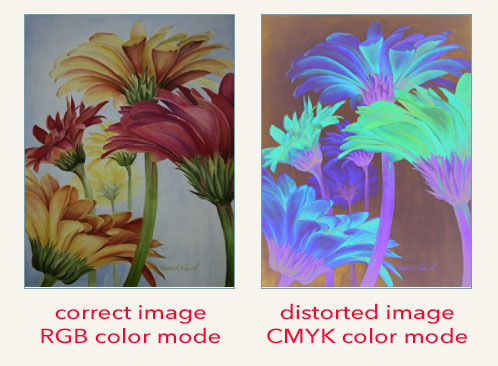 To change the color mode, you need to use a photo-editing software like Photoshop, then re-upload your image. How do I reply to an email in my message log?